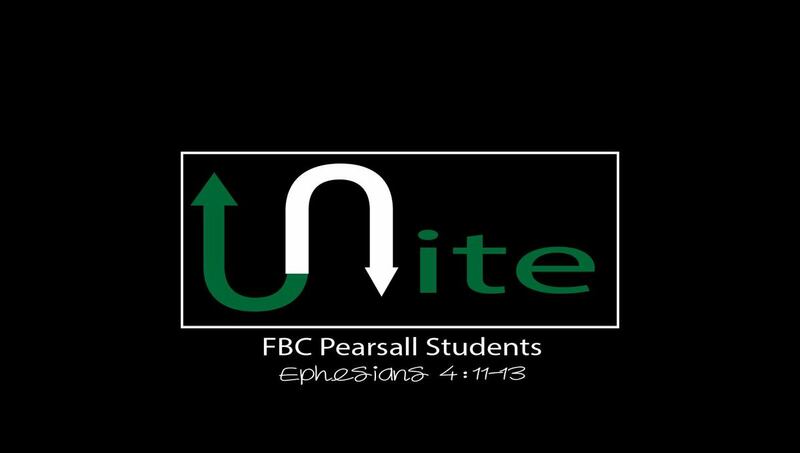 UNITE is our Youth Ministry here at FBC Pearsall. Our verse for the youth is Ephesians 4:11-13 "So Christ himself gave the apostles, the prophets, the evangelists, the pastors and teachers, to equip his people for works of service, so that the body of Christ may be built up until we all reach unity in the faith and in the knowledge of the Son of God and become mature, attaining to the whole measure of the fullness of Christ." Meaning Jesus calls us to equip people to become disciples so that we all may have faith in Jesus. Our vision is that it can be a place that we not only come to, but a place we are sent from. Sunday Night Unite 6:00 pm—Games, Worship, Community, and Bible Study. Meet in the Youth Building. Junior Varsity(7th-8th grade) 6:00-7:00 pm Games, Worship, Community, and Bible Study. Varsity(High School) 7:15pm-8:00pm Games, Worship, Community, and Bible Study. ELEVATE is an amazing in-town weekend retreat for students 7th-12th grade. The students will spend Friday and Saturday nights at a designated “host home” with 8-10 students of the same gender and grade, along with a leader. The schedule includes several teaching times, worship, a service project, and a fun recreation time with friends. Anybody in 7th-12th grade wanting to have a good time and hang out with friends. First Baptist Church Pearsall. JH and High School will have their own host homes they will be staying at each night. And will be back at the church during the day. To ultimately grow in community while serving our community and learning more about our Jesus.